16 x 5ltr bottles of Sir-Lush slush drinks syrup. We usually send Strawberry red and Blue raspberry but these can be changed. 2000 x Medium branded cups (10oz) These can be changed on a pro-rata rate. 2000 x Coloured spoon straws. 2 x Sir-Lush branded printed flags for indoor or outdoor use. 2 x Sir-Lush branded A1 printed posters. The new Skyline 2 is our best-selling machine. A good counter top machine with a small footprint making this machine ideal for most businesses. The two 10 litre bowls can produce 50 to 80 200ml cups per hour each*. Ready to serve in 40 – 50 minutes. Running on around 850w makes it economical to run too. *Estimate dependent on ambient temperature. 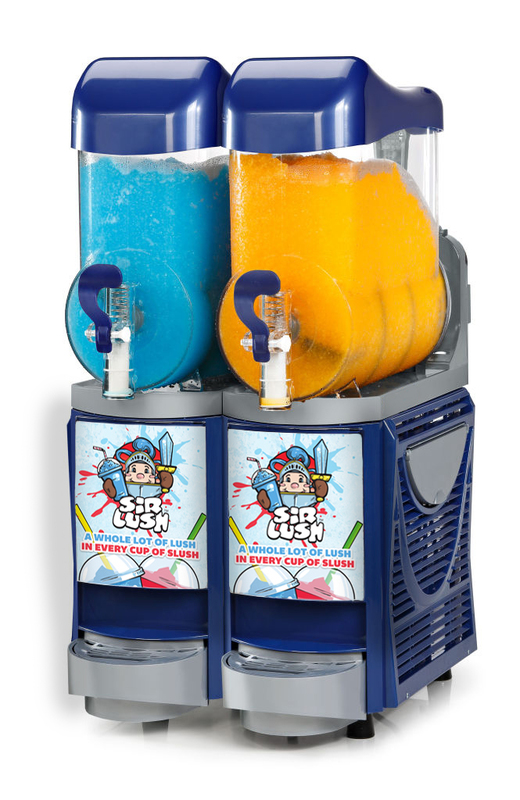 CAB Skyline is a multifunction slush machine that can produce and dispense products such as slush, cream, yogurt, sherbets and alcohol-based products. Thanks to particular design choices and the use of plastic panels, it has been possible to create a design with the best air circulation in the category, giving the cooling system a long life and high performance even in extreme conditions. Available with one, two or three 10-liter tanks.